It’s nearly time for the January transfer window, so we’ve put together a list of ten big deals being talked up as we’re now less than a week away from the madness beginning. 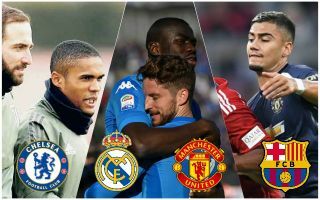 While it may take some time for things to get into full flow, it seems the likes of Manchester United, Chelsea, Arsenal and Liverpool have some targets lined up to come in in the middle of the season. It’s often the case that there aren’t quite as many signings as talked up in the press – especially in January – though the rule change regarding being cup tied in the Champions League could make all the difference in terms of big moves between Europe’s elite. Though this deal would cost £70million, it’s been claimed by Rai Sport, with translation from the Metro, that United have made an opening offer of £54m for Juventus winger Douglas Costa. The Brazil international is precisely the kind of flair player the Red Devils need in attack, with Alexis Sanchez struggling since joining from Arsenal last January. It remains to be seen if United will in fact up their offer, but it seems they are majorly interested in Costa, who could undoubtedly transform their season if he does join. Long linked with United and other clubs, the latest from Don Balon is that the Red Devils remain among Kalidou Koulibaly’s suitors, though he could also be tempted by a move to Spain with Real Madrid. The Senegal international is said to be eager to escape Italy after being racially abused by Inter Milan fans this week, so that could give United a potential boost in their pursuit. Don Balon add that Koulibaly would likely cost around £72million, and it’s clear he could be a bit of a bargain for MUFC if they get him for that price, given that the 27-year-old would be a big upgrade on the club’s current crop of centre-backs. This one seems very much in the works, with Sport Mediaset claiming Chelsea are ‘finalising’ talks over signing Gonzalo Higuain. The Argentina international only recently moved from Juventus to AC Milan, but could be on his way to Stamford Bridge this winter to majorly improve a problem position for the Blues. That report above also suggests Alvaro Morata will be on his way to Milan as part of any deal that would see Higuain move to Chelsea. This seems ideal for both clubs, with Morata flopping badly in his time in England, but previously showing he can do the business in Serie A, so not looking too bad a replacement for Higuain at the San Siro. Alvaro Morata heading for AC Milan in Gonzalo Higuain swap transfer? Long linked with AC Milan, could this finally be the transfer window that Cesc Fabregas leaves Chelsea for the Italian giants? The Evening Standard recently quoted Milan chief Leonardo admitting his team had considered a move, though it remains to be seen how advanced any talks have been for the Spain international. No longer a regular for CFC, it would make sense for Fabregas to move on for a new challenge, with Milan a side he may still have plenty to offer to at this stage of his career. French source L’Equipe, as translated in the tweet below by Matt Spiro, have claimed Arsenal are leading the running to sign Lille star Nicolas Pepe at the moment. This would be a superb signing for the Gunners if they could pull it off, with the Ivory Coast international one of Europe’s most in-form attackers so far this season and looking set for a big career at the top.